Предлагаем к чтению аннотацию, описание, краткое содержание или предисловие (зависит от того, что написал сам автор книги «Rising»). Если вы не нашли необходимую информацию о книге — напишите в комментариях, мы постараемся отыскать её. Rising Dr. Tom Hunter, an English professor with nationalist sympathies, arrives in St. Petersburg to address a conference of nationalists from across the white world. Russia’s globalist masters, however, will stop at nothing to smother every spark of Russian pride and self-determination. Hunter’s theories and comfortable life in the West prove scarce preparation for a plunge into an utterly alien world in which criminals, terrorists, ideologues, religious fanatics, and self-sacrificing patriots battle ferociously for the future of a nation. Is Hunter just a dilettante and revolutionary tourist, or does he have the strength and commitment to join forces with the rising Russian nation? 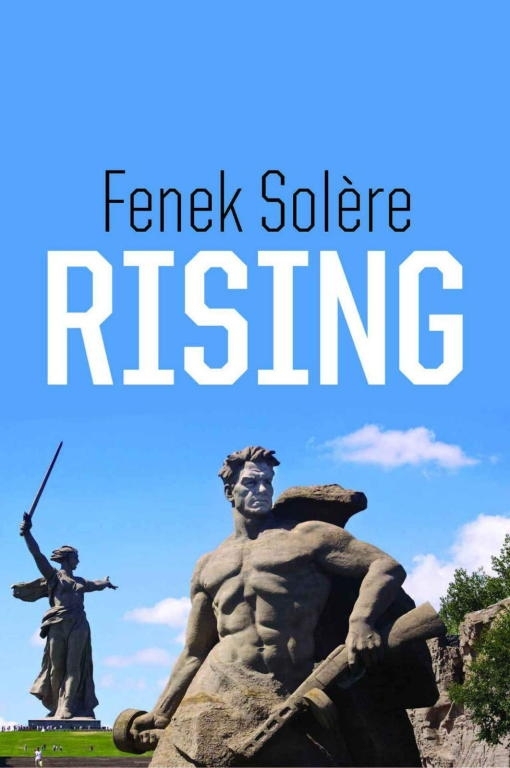 Based on years of experience in the underworld of the Russian far Right, Fenek Solère’s is a vivid and intoxicating novel of revolutionary ideas and world-shaking action. Кто написал Rising? Узнайте фамилию, как зовут автора книги и список всех его произведений по сериям. Ниже представлен текст книги, разбитый по страницам. Система автоматического сохранения места последней прочитанной страницы, позволяет с удобством читать онлайн бесплатно книгу «Rising», без необходимости каждый раз заново искать на чём Вы остановились. Не бойтесь закрыть страницу, как только Вы зайдёте на неё снова — увидите то же место, на котором закончили чтение. From his window seat, the much-maligned Thomas Hunter, PhD of London squinted at a chequerboard of flooded fields through electrostatic twilight. A vast empty land, the Ulyanka, slashed by railway lines, stretched tight and taught like bowstrings ready to fire. Highways edged by gas pipes, tall residential blocks, and belching chimney stacks tarnished a beautiful Baltic sunset. Sitting targets, he surmised, for the militant sects now harassing the Motherland. Ears popped as the 747 went into freefall, wings wafting down through air pockets, drifting on water vapour, wheels locking in place with the gratifying grind of hydraulics. Reports of the Great Migration and the Third Chechen War were still fresh in his mind as the lights of the control tower came into view. They hung like a necklace of septic pustules around the tattered Federation flag, luminous orange circles intersected by the insect silhouettes of ground staff running back and forth, shadow people from an Orwellian novel. When tyres hit tarmac, the sudden sparking jolt tested his seatbelt. Half-hearted applause rang out. The superstitious Slavs thanked God and the flight-deck for a safe landing. A voice crackled over the intercom, asking restless passengers to remain seated until the ground crew were in position. Predictably, everyone ignored the advice, scrambling for hand luggage, throwing open overhead lockers, blocking the aisle with bulky hips and bulging bags of duty free. The ping of SMS messages sang in breast pockets. Claustrophobic moments followed, then the doors opened, allowing a ghostly mist to enter the dimly-lit cabin. People shuffled forward, disembarking onto the docked platform. When the Professor descended the rattling steps, a strong gust caught his flapping coat, black moleskin billowing, until he gathered it in and buttoned it under his chin. Tom surveyed the burnt ochre skyline as he crossed the runway’s metalled surface. The airport had suffered rocket attacks by insurgents. Walls were pock-marked from small-arms fire. News of the almost daily terror attacks on Russian civilians angered him. Muslim militia roaming along the banks of the Kamenka River near Suzdal had nailed a ten-year-old virgin, cruciform style, to the golden door of the Cathedral of the Nativity. Rumours that the Tartar population of Sviyazhsk in Ingushetia were drowning Whites in the Kuybyshev reservoir had now been verified by independent sources. • Two new Borei-class SSBN submarines undergoing sea trials near Spitsbergen are surrendered to a NATO flotilla operating out of Bodo. He felt the wind pull at his hair, eyes registering the cityscape, witnessing scenes reminiscent of Dmitry Glukhovsky’s futuristic fiction Metro 2033. A stewardess appeared like a genie smothered in smog, blue scarf whipping in a rotor’s tail-wind. She was pointing to a ramshackle bus, something the Wehrmacht might have deserted at the end of their nine-hundred-day siege. Insects dotted a mud-splattered chassis. A militia man with a GSh-18 automatic waved the passengers on, climbing aboard, reaching for the leather straps dangling like NKVD ropes from the stained roof. With a clunky churn the engine ground into gear, dragging the potbellied pig one hundred metres across the runway. Gasping and choking, steam spraying from a perforated radiator, the lumbering beast came to a hissing halt just short of the gulag-grey terminal. Представляем Вашему вниманию похожие книги на «Rising» списком для выбора. Мы отобрали схожую по названию и смыслу литературу в надежде предоставить читателям больше вариантов отыскать новые, интересные, ещё не прочитанные произведения. Обсуждение, отзывы о книге «Rising» и просто собственные мнения читателей. Оставьте ваши комментарии, напишите, что Вы думаете о произведении, его смысле или главных героях. Укажите что конкретно понравилось, а что нет, и почему Вы так считаете.